Could a Lying Philly Cop Get a Job With Another Department? 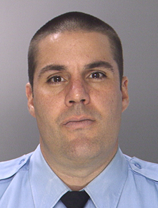 Former Philadelphia Police Officer Christopher Hulmes. Photo courtesy of the Philadelphia Police Department. Former Philadelphia Police Officer Chris Hulmes got caught perjuring himself. He admitted as much. Should he so choose, state law would still allow him to start a new job at a different police department elsewhere in Pennsylvania. A Court of Common Pleas judge found in 2012 that Hulmes “forthrightly testified to the court that he lied consistently throughout to the… magistrate and that he lied at the preliminary hearing and that he lied to his K9 officer” in a Kensington drug and gun case. Hulmes faced no charges for three years after he admitted to perjury. Internal Affairs and the District Attorney didn’t investigate and charge him until after City Paper ran a story on the topic in 2014. Beyond this, local District Attorneys maintain control over admission criteria. Hulmes agreed never to rejoin the Philadelphia Police Department when he entered the ARD program, according to a spokesperson for the District Attorney’s Office. Courts have acquitted Philadelphia officers in several recent criminal cases. But the decision to admit Hulmes to the program was “complicated,” Philadelphia assistant public defender Bradley Bridge told the Philadelphia Inquirer. The perjury charge was Hulmes’ first offense. But it also represented a serious breach of public trust. The ARD agreement also leaves Hulmes free to continue his career at another police force. A District Attorney spokesperson confirmed to The Declaration that the ARD agreement with Hulmes only covers the Philadelphia Police Department. State law doesn’t restrict Hulmes’ future employment options either. Pennsylvania’s Municipal Police Officers Education and Training Commission can revoke the certificate of any officer convicted of an offense punishable by one year or longer in prison. Perjury convictions certainly fall into this category. But a spokesperson for the Pennsylvania State Police, of which the Commission is a part, told The Declaration that completion of the ARD program does not count as a conviction. The State Police spokesperson also claimed that the Commission never received notice from Philadelphia Police regarding Hulmes’ dismissal and arrest, even though Commission regulations require it. Pennsylvania’s Confidence in Law Enforcement Act also bars those convicted of offenses punishable by more than a year in prison from serving as police officers. The Act, however, exempts officers who complete an ARD program. The state in this situation sets minimum standards. Local governments can raise those standards of their own accord. The Commission, for example, holds that police must be at least 18 years old. However, Philadelphia’s Civil Service Commission bars Philly police from newly recruiting anyone younger than 22. Officers must be at least 19 and have one year of experience to join the Philadelphia Police Department as a transfer officer. Nothing would stop Hulmes from seeking and gaining employment at any law enforcement agency that follows the minimum state standard. Police certification expert Roger Goldman confirmed for The Declaration that the Commission and the Confidence in Law Enforcement Act are the only authorities which set statewide standards for local police officers in Pennsylvania. Another danger, Goldman says, is that police departments might not receive adequate information about the background of a problem officer. If Hulmes completes ARD, his record will be expunged and another police department may not be aware of his history. Pennsylvania’s police certification laws are relatively weak. A recent study of certification laws nationwide found that while 80% of states decertify officers based on conviction of a felony, fewer decertify officers based on misconduct without a conviction. For instance, only half of the states would decertify an officer for illegal drug use and fewer than 40% decertify officers for conduct, such as perjury, that would amount to a felony if convicted. Court records show Hulmes will spend one year in ARD. Hulmes’ attorney did not respond to questions about whether he will seek future police employment after completing the program. The Declaration will continue to follow this case to learn whether or not Hulmes joins another police department. Correction: this story originally stated that the ARD program was created in the 1980s. It was created in 1972 but new guidelines were adopted in 1984.